Annual culls, loss of genetic diversity and climate change set the odds against American bison. Jeanine Pfeiffer is a contributor to Writers on the Range, the opinion service of High Country News. She is an author and ethnoecologist affiliated with San José State University in California. This winter, hundreds of bison will be slaughtered in Yellowstone and Grand Canyon national parks — again ­— and we shouldn’t let it happen. We owe a lot to the American bison (Bison bison), the West’s original engineers. When herds of these 1,000-2,000-pound animals graze, paw the ground, take dust baths or wallow in the mud, they help create fertile prairie mosaics. In the winter, snow trails made by bison open up grazing areas for their fellow herbivores. In spring, bison wallows host migrating waterfowl and amphibians. In summer, the foraging that bison do helps prevent catastrophic fires and encourages the growth of shrubs, favored nesting sites for prairie chicken and sparrows. And in the fall, their dried-up wallows shelter prairie dogs and plovers. For the First Peoples, bison are considered spiritual family members. Their existence on the land shapes memory and speech, song, ceremony and prayer. Bison-centric words and sayings and an encyclopedic understanding of the animal are represented in hundreds of Native languages. Before modern supermarkets, every scrap and smidgen of bison killed by tribal hunters was eaten, drunk, smoked, dried, pounded, carved, scraped, stitched, woven or worn. There was no American creature with greater ecological and cultural significance — until we exterminated 99.999997 percent of them. Seven generations later, the killings continue. Of the 600,000 so-called buffalo extant in North America, most are “beefalo,” an artificial mix of wild bison with domesticated cattle. 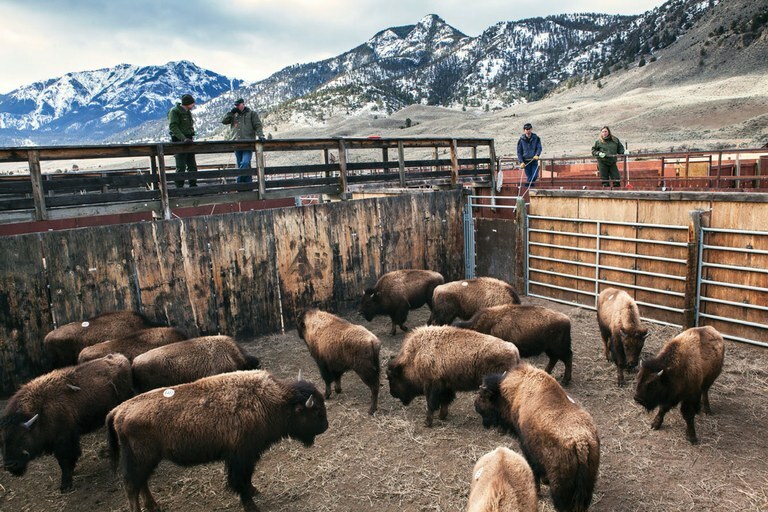 At the Stephen’s Creek facility inside Yellowstone National Park, rangers overlook holding pens for bison awaiting shipment to slaughterhouses in Montana. The Yellowstone National Park herd — around 4,800 animals — is the largest remnant of genetically pure bison, the final guardians of ancient DNA and environmental memories stretching back for millennia. These animals know how and where to migrate, how to communicate with each other and search for food, and how to withstand adverse conditions and care for one another. Stray bison not killed outright by hunters are captured by the Park Service and then sent off to slaughter. The agency’s rationale is both complex and simple — complex because of contradictory state and federal policies, and simple because we allow it. During the Great Depression, the U.S. government leased national forest lands surrounding Yellowstone as inexpensive feeding allotments to help ranchers survive economically. Almost a century later, U.S. taxpayers continue to subsidize private ranchers on these publicly owned lands. Cattle ranchers leasing those lands argue that brucellosis — an exotic disease that can cause spontaneous abortions in cows — is spread by bison, despite the lack of any scientific proof. Elk, deer, moose and bear populations also carry brucellosis and range freely throughout cattle lands. Yet no similar killing campaigns are waged against those animals. When ecologists justify the culling by pointing to the limited carrying capacity of Yellowstone ecosystems, they ignore basic genetics. Countless generations must occur for beneficial traits to be fixed in a genome. For bison to persist as a species, their genetic diversity needs to remain intact, or we risk inbreeding. When bison subpopulations with crucial traits are indiscriminately killed, it’s the equivalent of tearing out and obliterating entire chapters of the bison’s survival manual. Goodshield Aguilar, a Lakota activist with the nonprofit Buffalo Field Campaign, has tried to halt the Yellowstone bison culls for two decades. We have better options than slaughter. We can ban the culls in favor of transporting all excess, disease-free Yellowstone bison onto tribal lands. This will make it easier for the 63 tribes composing the InterTribal Buffalo Council to restore buffalo culture in their communities. We can offer incentives to ranchers to encourage them to accept bison grazing on cattle lands. We could also gradually eliminate subsidies like the ones in the current grazing system, which privilege a small number of businesses over our irreplaceable heritage. With climate change, bison — and the enormous range of species and habitats they support — will face longer droughts, extra-cold winters and other extreme weather events. Our national mammals deserve all the help they can get.